2013 for GIBBON is not only another year of innovative new products, like the SLACK RACK 300 or the amazing ANDY LEWIS TRICKLINE, it also brings up our all-time-classic-products as the X13-series – with new design and lots of new features! 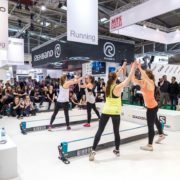 From the 3rd till the 6th of February the ISPO in Munich was the place to be. 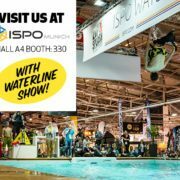 Sport equipment dealers and slackline pros had the chance to assure themselves about the innovations and the betterments of our products. And from now on the stuff is also available at your personal GIBBON dealer. 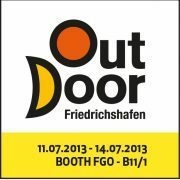 What else is to say about ISPO 2013? 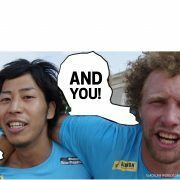 Ah right… the 2nd ISPO Slackline Open by KIKU! Together with the ISPO and our main sponsor KIKU Apples! 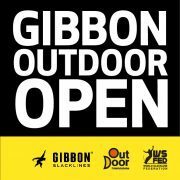 we were able again to organize two international, top-class slackline competitions! Participants from all over the world battled for the glory, the price money and the WSFed world rankinglist points! Congratulations to the winners and a big THANK YOU to all participants! 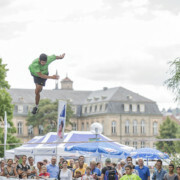 Besides the slackline World Champion LUKAS HUBER (IT) and the two Madonna-Slackliners JAAN ROOSE (EE) and CARLOS NETO (BR) also star guest ANDY LEWIS joined us in Munich. So on Tuesday, finally it was time to “Beat Andy”. GoMo Instant Energy bet 250 EUR that no one can beat Sketchy Andy, but at the end it was Immanuel Bumb who carried the money home with a big smile! => Sorry Andy, we hope Brazil will make it up for you. Send us a postcard of your new highline project there! …as well as to all our friends and supporters who make the ISPO year for year an outstanding event to remember! And last but not least – glorious as ever – STEREO TRICKZ! 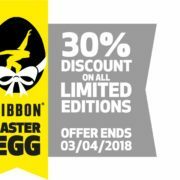 For funky tunes from the first to the last minute!